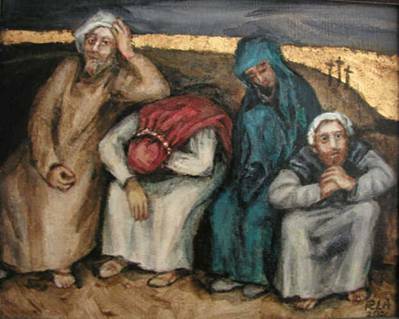 Today is what Christians call “Holy Saturday.” It is a day of reflection between the death of Jesus on Good Friday and his Resurrection. So unless something really unusual and earth shattering occurs I am going to take the Easter weekend to do some reflection, including on some spiritual topics. In light of that I am simply going to post three of my older fictional accounts of that weekend today, tomorrow and Sunday. As a genre this series falls in the realm of historical fiction, which means that while they may be set in a historical event, that they are fiction. Likewise, I admit that they and the main character are more a reflection of me, and my journey, and my over-active imagination, than my cursory study of Roman and New Testament History. That being said, have a nice weekend, and if you do it, have a nice Easter. The horrible day was passed and a new morning greeted Longinus as he arose. The sun rising over the escarpment in the east that overlooked the Jordan River cast a warm red and yellow glow as its rays infiltrated the window overlooking the courtyard of Fortress Antonia. It seemed an eternity since he watched the sun rise as Pilate debated what to do with that Jesus fellow. Longinus and his fellow officers Flavius and Decius had spent much of the previous evening in the tavern following the executions. It was not a typical night for them. There was little frivolity, few jokes and none talked much about the events of the day, which had begun for Longinus not long after midnight. Flavius, whose servant had been healed by Jesus in Capernaum had briefly discussed the meaning of Longinus’s comments as the Galilean preacher died upon the cross. Longinus pondered the words again. “Surely this man is the son of God” or something to that effect. He didn’t remember his exact words and he couldn’t even remember why he had said them, but then the day was long and the events struck a nerve. He had seen or taken part in many executions as well as difficult battles. He disliked executions in general but until now he had managed to keep his soul protected from from what he felt on Golgotha by the wall that he had built around his heart. He did not like what had happened the previous day. When Pilate gave in to the Jewish leaders in regard to killing the Galilean he very uneasy. Pilate should have damned the whole politics of the situation and let the man go. The events still bothered him. The man was innocent. Pilate knew it, Longinus knew, hell they all knew and yet all of them had aided and abetted those that wanted the man named Jesus dead. Longinus felt a shame that in all of his years of soldiering he had never before felt. Pilate was able to wash his hands of responsibility. Longinus wished he could do so for himself, but the blood of the innocent man, which still stained the tip of the lance that Longinus had plunged into him, would not let him. Longinus shook his head in disgust. Just then Decius knocked and entered with the news that Pilate had ordered a guard set at the tomb of Jesus. Supposedly the Jesus fellow had said that he would rise from the dead and the Jews wanted to make sure that no one tried to make off with the body of Jesus. Longinus was not surprised, somehow as strange as the week had been it made perfect sense. Set a guard over the tomb of a man who was betrayed by one his own, denied by others and abandoned by all but one? It was ridiculous; people don’t rise from the dead. Dead is dead. Longinus thought rather cynically that it was a waste of his troops time and effort. If the Jews were so concerned why didn’t they send their Temple Police to guard the tomb? But then he realized that such duties were beneath the Temple establishment. The dead were unclean, so get the infidel Romans to do the dirty work, that way if something went wrong they could take the blame. It figured. He ordered Decius to set the guard. As he did this he received a report that two of his Samaritan soldiers had been brought in by a patrol dead drunk late in the evening. He would have to discipline them later, that was the lot of a commanding officer. How he wished that he was commanding a unit of Italians in a home province or on a campaign rather than these Samaritan and Syrian cast offs in this God forsaken backwater of the Empire. At least he had a number of good officers under his command, perhaps if he remained in Palestine he could organize a transfer of he and his officers to the Italian Cohort stationed in Caesarea where his friend commanded one of the units. Though he too was based in Caesarea it was much better to be assigned to that Italian unit rather than the locally recruited units. Flavius joined them as they set down to eat breakfast. Outside Quentin and other sergeants mustered the men, and proceeded to carry out the order of the day. Patrols were dispatched to remind any Zealots or sicarii that even if they had gotten Pilate to do their bidding regarding the Galilean that Rome was still in charge of their capital. The officers discussed details of the planned movement that would take them back to Caesarea in the next couple of days, whenever Pilate decided that the situation in Jerusalem was calm enough to leave. That would be a day or two at least as the multitudes that had come to observe Passover from the diaspora returned to their homes about the Empire and beyond. The sun now shown brightly through the window and Pilate looked at the still menacing hill known as Golgotha, now devoid of crosses. He thought about that final scene yesterday amid the gloom as the tree men including the Galilean hung suspended between the heavens and earth. It was a sight that he would not soon forget. Flavius and Longinus hoped for an uneventful couple of days in order to prepare for the always-dangerous trip through Judea. 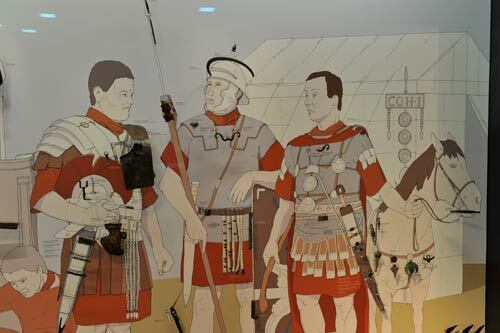 The Zealots, the Sicarii and other insurgents always hoped to kill Roman soldiers. But tonight, the Gods willing Longinus and his comrades would meet over a cup of ale in the tavern and maybe things would begin to return normal, whatever that meant in this place.